You guys, I was so excited to see this movie, and it was everything I’d hoped it would be. This movie is exactly what you’d expect it to be, which is exactly why it was flippin’ awesome. I’ve become a huge fan of the films put out by The Asylum. I haven’t seen a ton of them so far, but I plan on plugging through their back catalog in the near future. They make movies that are unapologetic about what they are, which is essentially modern grindhouse cinema. Their movies are made to appeal to a certain demographic in a lowest common denominator way, and do so without pulling any punches. 2-Headed Shark Attack is a great example of this. I honestly don’t know what else to tell you. 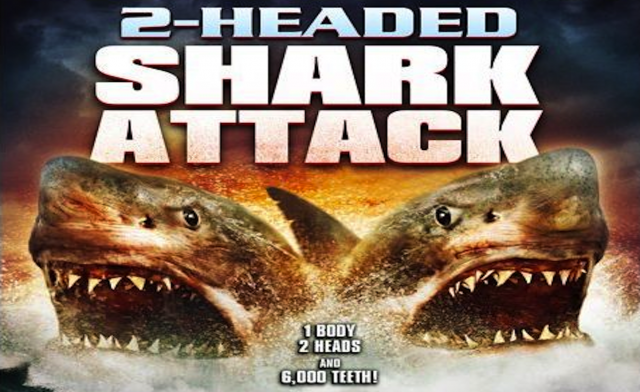 The movie is called 2-Headed Shark Attack. If you hear the title and think, “That sounds awesome”, then you’ll dig this movie. Period. Get yourself a copy of “2-Headed Shark Attack” from Amazon!